Carol Fry (with her pilot Kev), Skydiving to raise money for the Welsh Guards Afghanistan Appeal. Carol was born and raised in Wiltshire but has always loved Wales. In September 2011 she finally realised her dream to come ‘home’. She currently teaches in a primary school in Tremorfa (Cardiff), living near Pontyclun (Bridgend). Carol loves to explore Wales, visiting both new places and those that she knew as a child. She also enjoys baking, concerts, shows, musicals and opera. This is a guest post by Carol Fry (@CVFry on Twitter) on the subject of online fundraising. I first found Carol on Twitter through our shared love of classical music and opera, but was quickly amazed and inspired by her ability to harness social media to raise money and awareness for good causes. She was also a key figure in the promotion of a charity single recorded by Mark Llewellyn Evans and the Band of the Welsh Guards. Carol is a personal source of inspiration to me; I think charities and good causes (big and small) could learn a lot from her creativity, enthusiasm and determination. It’s amazing where a casual remark can land you! On April 1st – I should have known to keep quiet – I was in a car with Mark Llewellyn Evans, a gifted singer who has worked tirelessly to raise funds for our wounded soldiers, recording a CD with the Band of the Welsh Guards for their regimental charity. 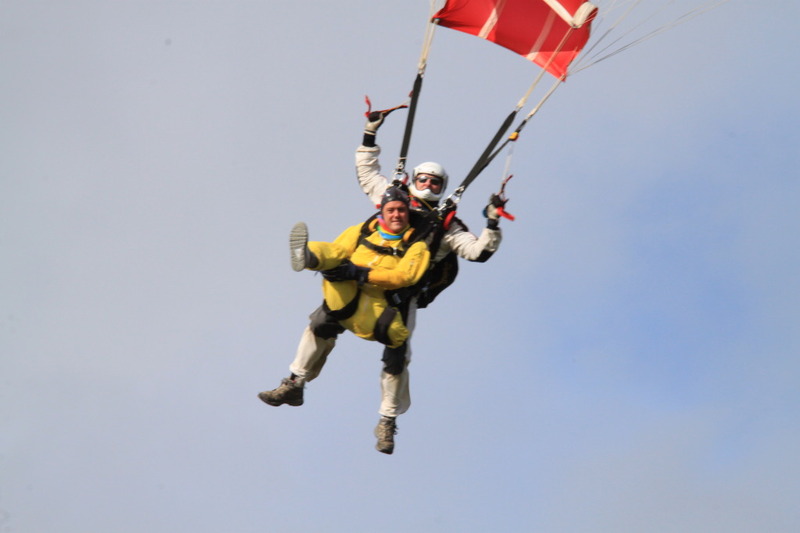 We were travelling along the M4 towards a sunny (yes, really) Swansea when I mentioned I’d always wanted to do a sky-dive. I don’t really remember how the conversation started but two months later I was tumbling from the sky with a member of the Paratroop Regiment strapped to my back, raising funds for the Welsh Guards Afghan Appeal. Through Mark I met Dale Leach, a former Welsh Guard and one of the most amazing men anyone could wish to know. Dale was seriously injured by an IUD in Afghanistan in 2009. 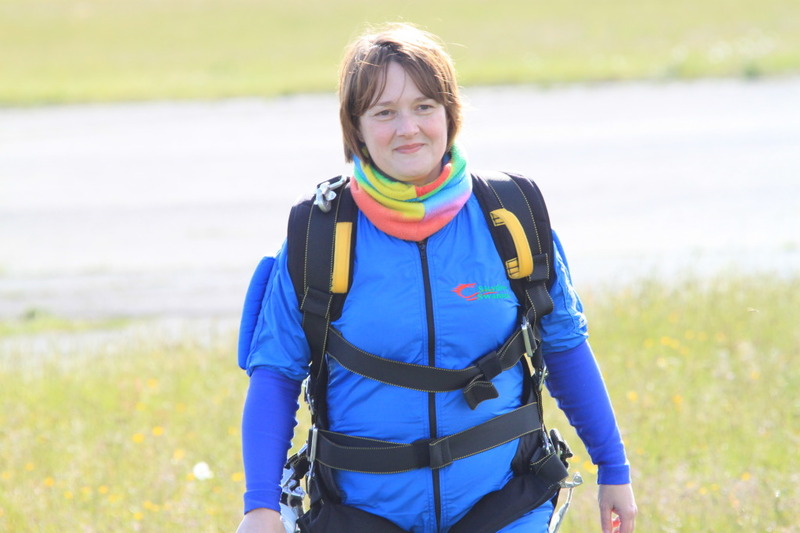 His story made me determined to keep my promise to undertake the sky-dive. I told him about it and, despite having lost a leg, fractured his spine in 3 places and suffered numerous other injuries, Dale agreed to dive with me. Our friends in the Band suggested using an online giving site and set up a page for us on Virgin Money Giving. 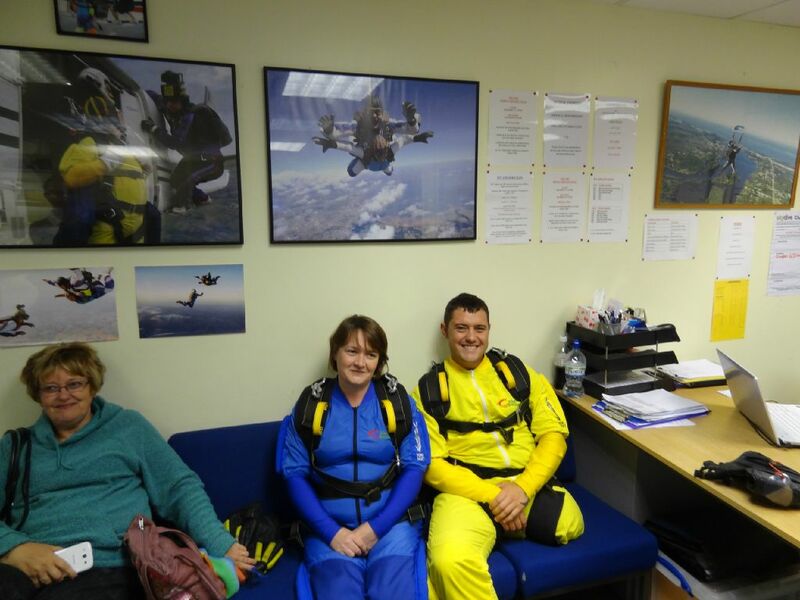 Carol and Dave suited and booted before their skydive! Using this site, my Twitter account and through friends promoting our dive through retweets and on Facebook we reached far more people than if we’d just been collecting by word of mouth. I have even made new friends through the collection, as total strangers read Dale’s story and made contact, wanting to help out. I’m not a particularly confident person and would have found it hard to ask anyone other than very close friends and family to sponsor me. Using Twitter, Facebook and online giving meant that I could put out general appeals without feeling that I was badgering people. I probably drove my followers mad over the month or so before the dive but I have been overwhelmed by the generosity shown by people in their giving. Using social media also enabled my friends who couldn’t help financially to chip in. They could retweet and post messages on their Facebook walls, spreading the news of what we were doing even though they couldn’t give money. Using online giving and social media also got some press attention. One newspaper story and 2 radio interviews later, including singing live to Mr Go Compare (the wonderful Wynne Evans) on his radio show, we had picked up sponsors from overseas and parents from my school asked to support the jump. We did make some money for the Appeal by ‘traditional’ means but I am absolutely certain we would not have raised anywhere near as much without the news grapevine offered by social media. Dale (and pilot) parachuting back to earth. We originally set a goal of £1000. In the end we raised just over £1900 and nearly £1700 of that came from online giving. My friends and family are spread all over the UK and the site made it really easy for them to give and for us to gather Gift Aid. I am certain it would not have worked without Twitter, Facebook and the kindheartedness of people I have never met face to face. If you are planning a fund-raising event I’d strongly recommend using social media to help you. Get out there and Tweet – there’s a world filled with generous people who will help your cause however they can. Carol and Dale’s fundraiser has now ended, but you can donate to the Welsh Guards Afghanistan Appeal by following the instructions on their website.